The 1940s were a tumultuous time in the United States, with most young American men serving overseas either in Europe or in the Pacific for the first half of the decade. When World War II finally ended in 1945, waves of American GIs began to return home, ready to get a taste of that freedom they had been fighting for. While some chose to settle down and raise a family, there were still plenty of others who were ready to cut loose behind the wheel of a hot rod automobile or behind the 'bars of a "Bob Job" motorcycle. 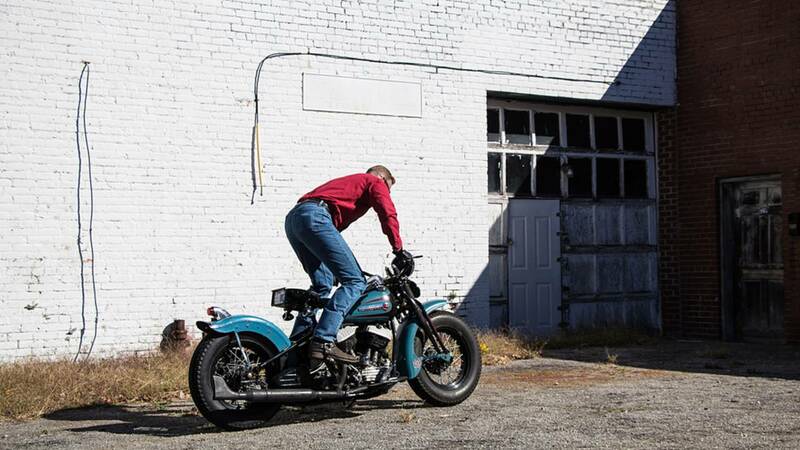 To get a feel for the type of motorcycles that were roaring down the streets after our victories in Europe and the Pacific, I'll be reviewing a 1947 Harley-Davidson UL Bobber. 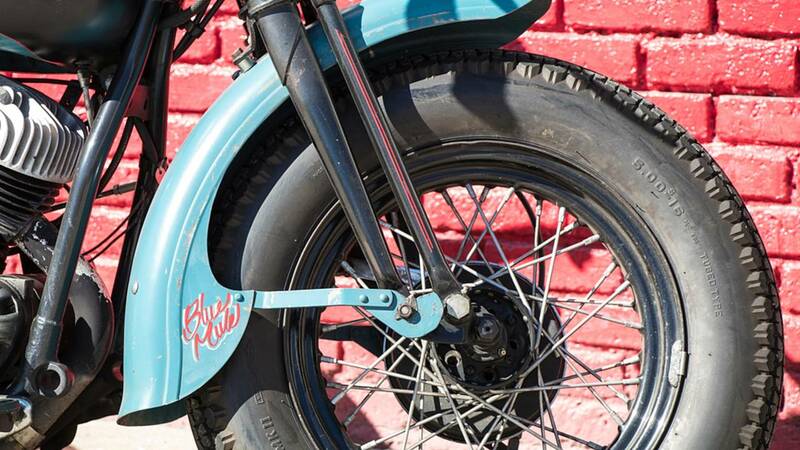 Minimal sheet metal and removal of unnecessary parts are trademarks of the bobber style. The terms "Bobber" or "Bob Job" both refer to the same style of motorcycle, that being one that has been stripped of all unnecessary parts – which often includes ditching the front fender altogether and shortening or "bobbing" the rear fender. Bob jobs first became popular in the 1930s when Harley and Indian started fielding stripped down machines for the newly organized Class C races. Many riders appreciated the no-nonsense look of these new race bikes and modified their own motorcycles to match. Ditch the lights and this '47 would be ready to hit the dirt track. While the first bob jobs were generally plain looking machines, the next wave that came about after WWII saw a lot more customization. 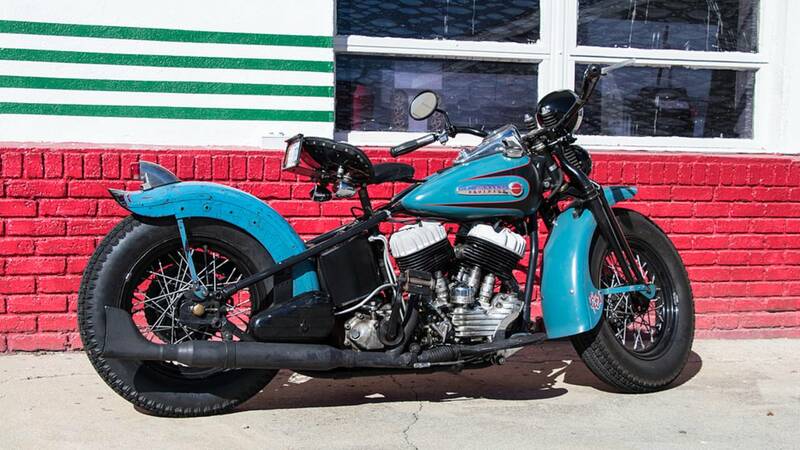 Wild paint schemes, chromed parts, upswept exhaust pipes and raised handlebars became the norm as these motorcycles evolved through the 50s and 60s. 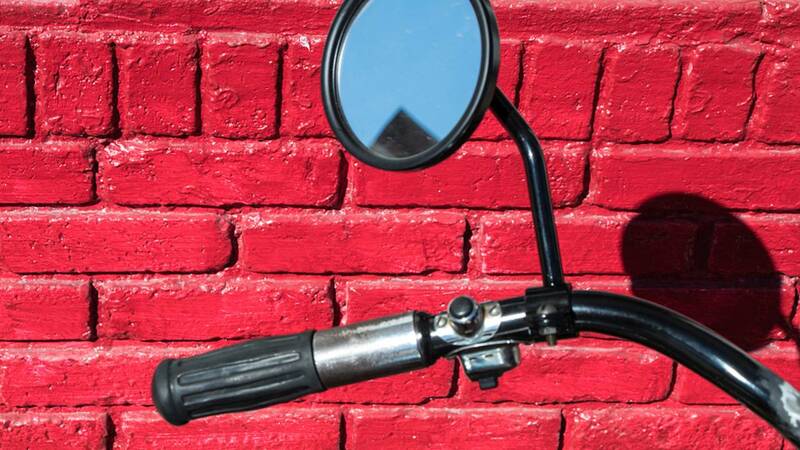 When Easy Rider hit the big screen in 1969, choppers were already beginning to rise in popularity and would soon dominate the custom bike scene for the next decade. Bob jobs made a come back in the late 1990s, which was when the word Bobber became the accepted term to describe their stripped down style. 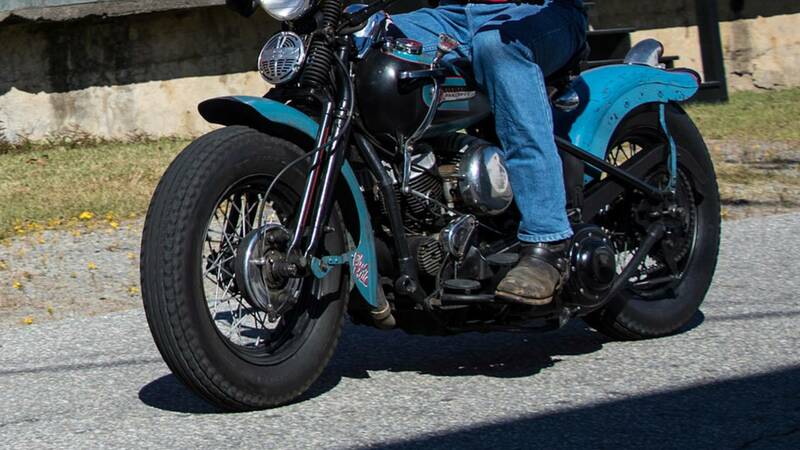 The shortened or "bobbed" rear fender is what gave this style its name. Normally the rear fender would wrap around the back of the tire. Harley-Davidson debuted the U-series in 1937 as a replacement for the V-series which had been their primary line of "Big Twins" since 1930. One of the most notable improvements found on the the U-series was a new design which recirculated the oil from the oil tank, through the engine and back to the oil tank. Up until 1936, all Harley-Davidson motorcycles used "total loss" systems which essentially ran the oil from the oil tank, through the engine and ultimately onto the ground. The U-series not only had a separate oil tank (previous oil tanks were combined with the fuel tanks) but for the first time a return oil line. 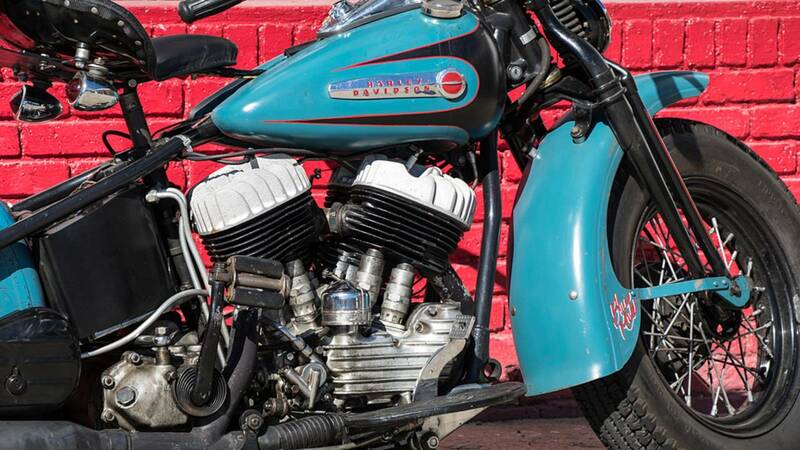 The standard UL motor is a 74-cubic-inch V-twin (although this particular machine has been upgraded to 80 cubic inches with aftermarket pistons and cylinders from S&S) and is a side-valve configuration. This means that the intake and exhaust valves are located in the cylinders, adjacent and parallel to the cylinder bores. A pair of side-valve cylinders. You can clearly see the intake and exhaust valves next to the cylinder bore. The valves are actuated by four gear-driven camshafts (one per valve) and use adjustable tappets to maintain precise spacing between the cam lobs and the valve stems. Although the cylinder heads do not contain any moving parts, they do play an important role in cooling the engine. 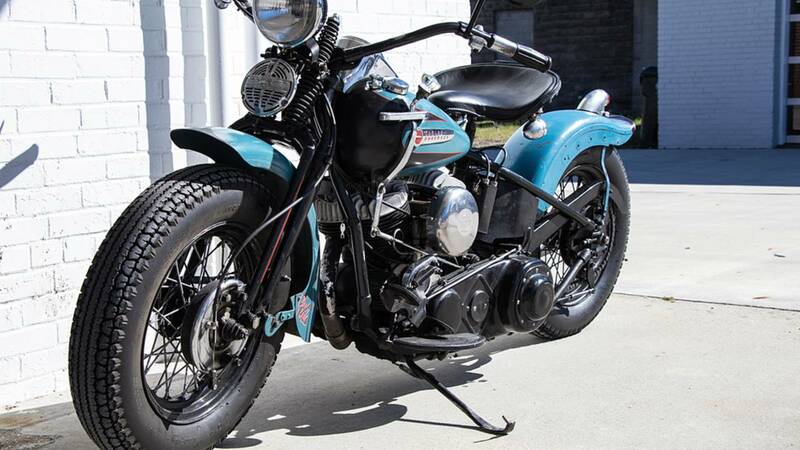 Initially Harley-Davidson outfitted the U-series motors with cast iron cylinder heads, but soon switched to aluminum alloy heads for improved cooling. Fuel and air are fed into the motor using a single Linkert butterfly-style carburetor, which faces the left side of the motorcycle. Harley switched this arrangement for its overhead motors, which all have right side carburetors. Spent exhaust is expelled via a single fishtail muffler. Mounting the carburetor on the same side that the motorcycle leans when on the kickstand often leads to fuel leaks in the parking lot. A leftside primary chain transmits power from the engine to the 4-speed transmission. The transmission is hand shifted via a lever mounted on the left side of the fuel tank and the clutch is controlled with a foot pedal. A secondary chain transmits power from the transmission to the rear wheel using a brake drum mounted sprocket. The shifter ball is actually an antique glass door knob from the owner's home. The braking system on the UL is your standard 1940s technology using front and rear drum brakes. 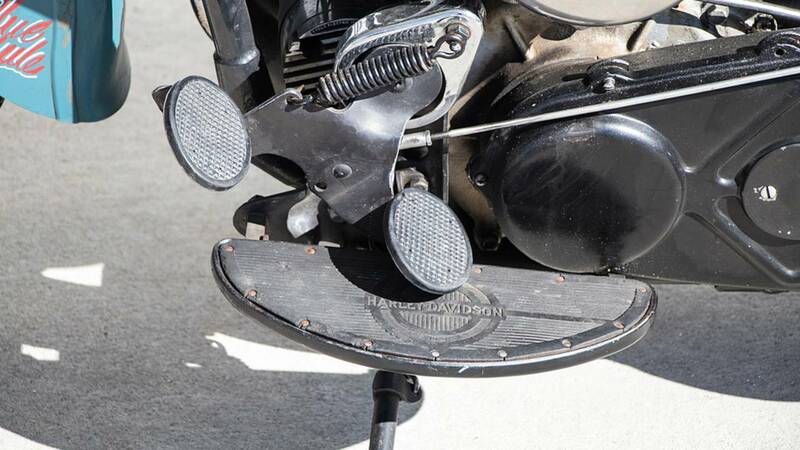 Like most of Harley's early braking systems, the front brake leaves a lot to be desired and your main braking comes from the larger rear drum. Both brakes are completely manual with no hydraulic assistance. The front uses a cable to connect a right side mounted hand lever to a left side mounted drum. The rear uses a series of adjustable rods to transmit the motion of the right side brake pedal through the frame and out to the left side mounted rear drum. The chrome front brake drum looks great, but has nowhere near the stopping power of modern disc brakes. The UL rides on a "hardtail" frame, which means there is no rear suspension whatsoever. The lack of rear suspension is partially negated by the use of a sprung solo seat. This design works like a pogo stick in that there are a number of springs mounted on a single shaft inside the rear frame downtube and connected to the middle of the seat pan. A pivot point at the front of the seat is attached to the top of the frame to provide extra stability and only allows the seat to move up and down. 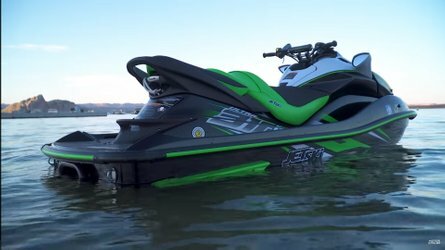 The only real suspension on the UL is the "Springer" front end. This is a two piece front end that uses six external springs on the top and moveable rocker arms on the bottom. The springs obviously absorb impacts while the rocker arms permit vertical movement of the front axle. The front end has two inverted u-shaped legs. The rear is fixed to the frame and the front can move up and down on springs. Rocker arms connect the legs at the bottom and allow for the up and down movement of the front leg. While this might not seem like a lot of suspension, there is one more piece to consider. 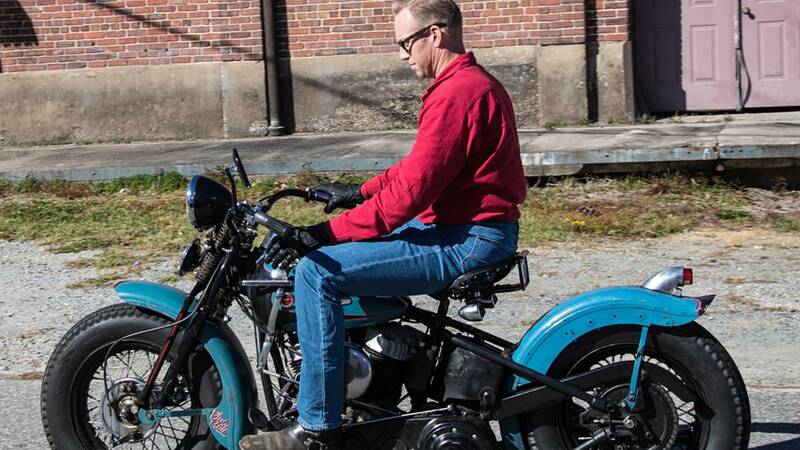 On motorcycles of this vintage, the tires were also an important part of the suspension. Tires back then ran on much lower pressures, sometimes as low as 12 psi. This resulted in a much more pliable tire that could also soak up some road bumps. Even though this machine is fitted with modern tires, the pressure is kept around 20 psi. 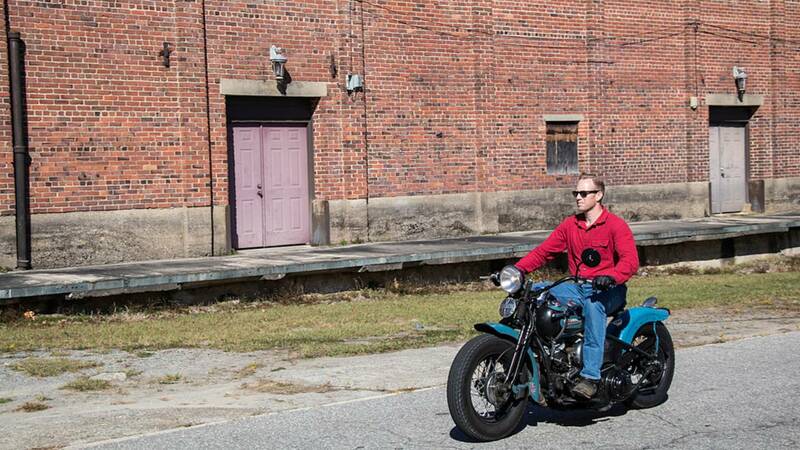 By the 1940s, Harley had come up with a dash design that they would essentially keep for the next 75 years. 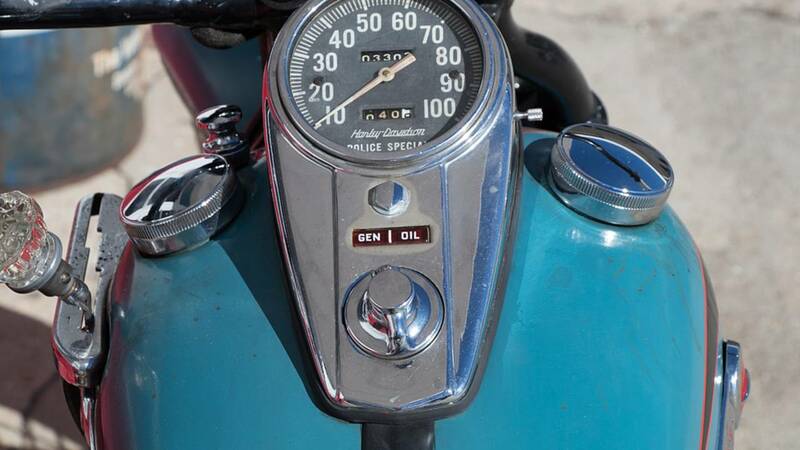 At the center is a large face speedometer (you'll note that this bobber is using an original police unit) and a keyed three position ignition switch. There are two indicator lights between the ignition switch and the speedometer which include a low oil pressure light and a non-charging generator light. 100 mph is wishful thinking on this machine, but purpose built race motors like this have been clocked at over 180mph at Bonneville. As with modern day motorcycles, the right hand grip controls the throttle. The right side also has the front brake lever. 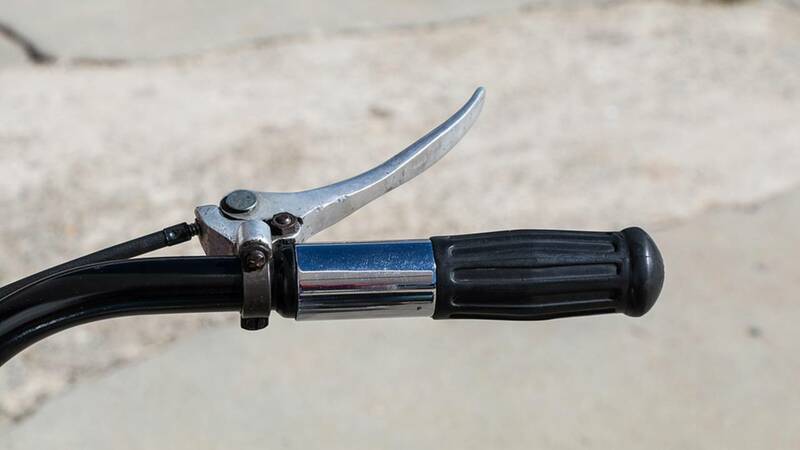 Technically, the front brake lever should be on the left hand side of the handlebar, but when switching between modern and classic motorcycles, some consistency is nice (especially in an emergency). An internal throttle cable keeps the handlebars clean and tidy. The left hand grip operates the timing, allowing you to retard the timing for easy starting and advance the timing for normal running. 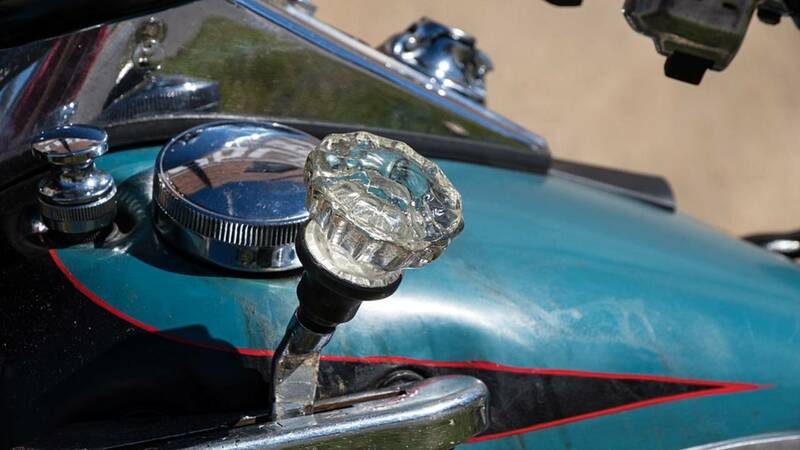 The horn button and the high/low beam switch for the headlight is located on the left side handlebar as well. 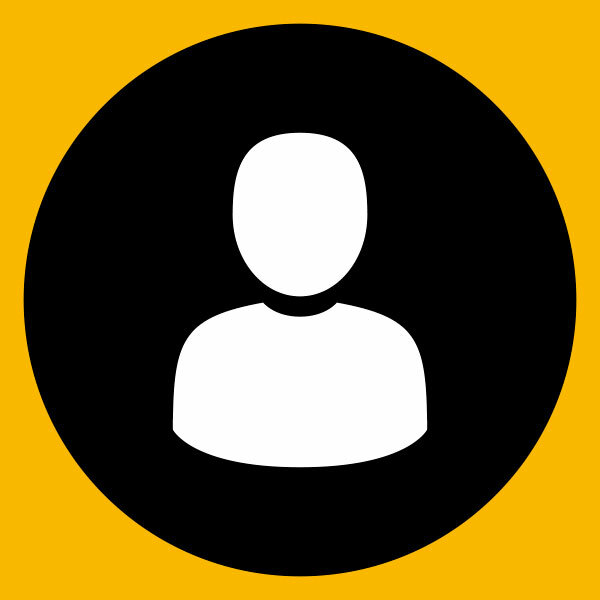 All your buttons and switches are on the left, leaving your right hand free to operate the throttle. Shifting is accomplished using a hand lever that is attached to the left side of the fuel tank. A shift gate helps the rider find the gears without skipping gears when shifting. The foot operated clutch, known as a "rocker clutch" is used to engage and disengage the clutch. 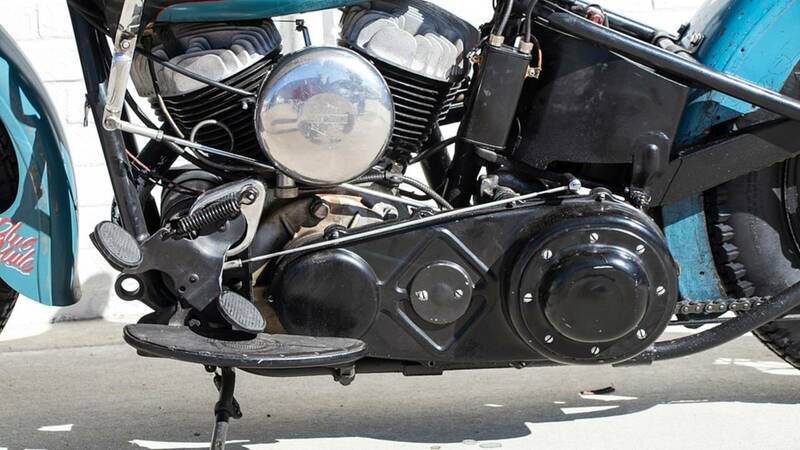 All Harley's use the "toe to go" set up where pressing the clutch pedal forward with the toe engages the clutch and pushing the pedal back with the the heel disengages the clutch. 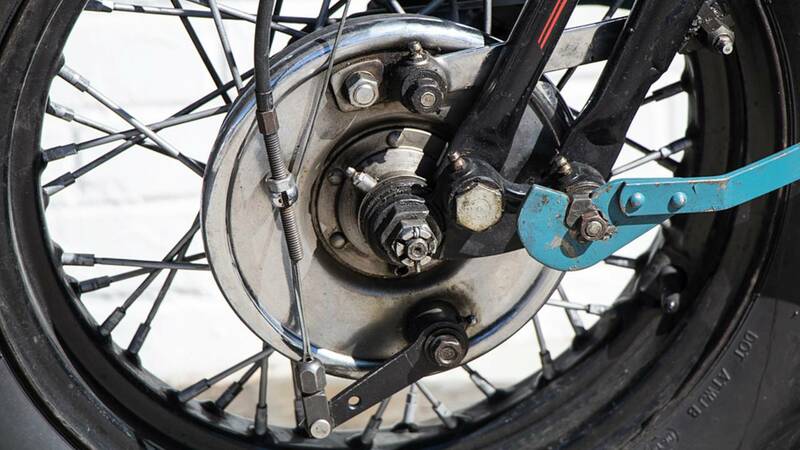 A friction disc is used to keep the clutch pedal in the heel back position, so that the rider does not have to keep his foot on the pedal when the motorcycle is stopped. Clutch pedal in the "heel down" position. In this position the clutch is disengaged. The first thing that struck me about this motorcycle was how easy it was to start. The low compression flathead motor was no problem to kick over and with a little practice could probably be done from a seated position. Side-valve motors are known for their low compression, which makes starting a breeze. The seat itself was very comfortable, with a wide supportive seat pan that has been the favorite of mounted police officers for years (police spend long hours on their motorcycles, so they know which seats are the best). The seating position is upright with your knee bent at a 90-degree angle when your feet are resting on the floorboards. The bars are wide and low, which provides great leverage at low speeds, but in tight turns the handgrips will contact your legs. I found the floorboards to be comfortable for my feet, but could have used a little extra room on the left side as the clutch pedal covers a good portion of the floorboard. Maybe people had smaller feet in 1947. Not quite enough room for my boot and the clutch on the left floorboard. Once onto the road, I was impressed by how easily the transmission shifted gears. 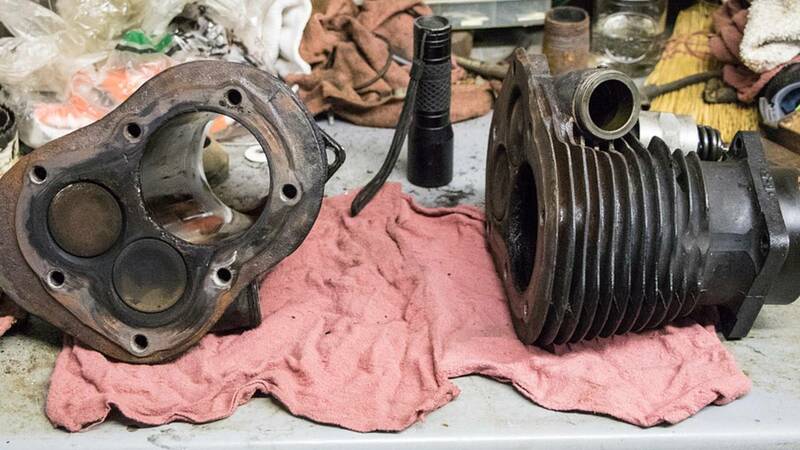 It is not uncommon to really have to jam on the shift lever to change gears on a vintage motorcycle, but this transmission was as smooth a butter. All it needed was a tap on the shifter knob and you were in the next gear. On the topic of shifting, it is important to note that the shift pattern starts with first gear at the rear of the shift gate so that you are always shifting forward when going up in gears. 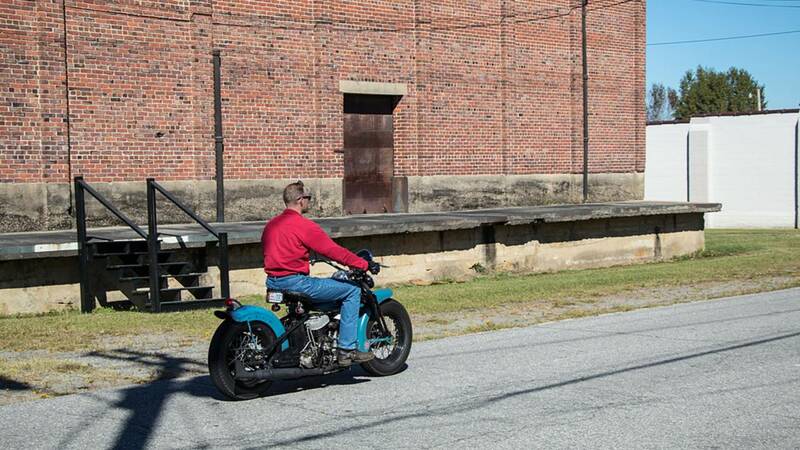 Older Harleys used the opposite pattern with first gear at the front of the shift gate and the rider pulling back on the shifter to go up in gears. The transmission was so smooth, I had to be careful not to skip gears. 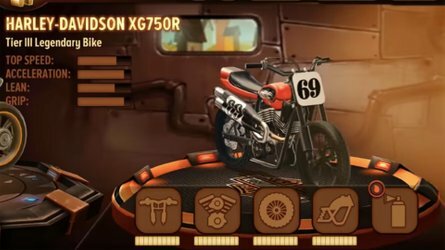 The Flathead engine ran smooth and although it is not made for high speeds, it provides plenty of torque, which is great for ripping around in town or cruising the back roads. Coupled with an overall lightweight platform (partially due to cut fenders and a general removal of unnecessary parts) the UL was very nimble and easy to handle. It still has enough weight that it can hold its own against passing trucks on the highway, but it is really at home cruising at 55 mph on secondary roads. Plus at 55 mph, you're at a speed that you can be confident your drum brakes can handle in an emergency. Smooth shifting and plenty of torque, what more do you need? 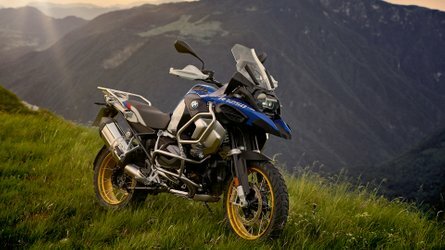 People often have the opinion that hardtail motorcycles are particularly uncomfortable, but I did not find that to be the case. The seat pogo essentially takes the place of the the rear shocks, and since it can be tailored to the rider's weight by changing springs, it has the potential to be just as comfortable as a modern motorcycle. The issue that can and does occur with the hardtail design is that when you hit a large bump in the road, the back tire has nowhere to go but up and has to take the frame along with it. 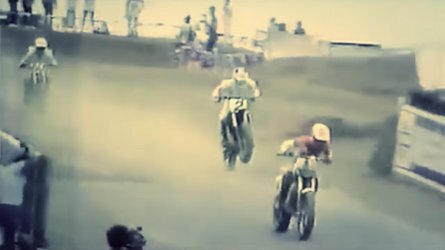 That actually sounds a lot scarier than it is and I can tell you that after riding a hardtail motorcycle across the country I never ran into any trouble – hitting innumerable bumps along the way. Riding around town was great, but this motorcycle was begging for some country roads. 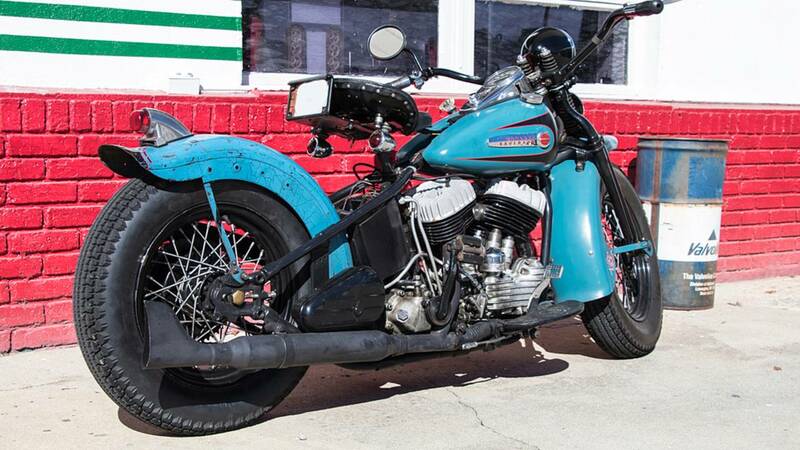 Overall, I really was impressed by this 1947 Harley-Davidson UL. From the pictures you can tell that it is a great looking motorcycle and I've seen it draw crowds on a number of occasions. 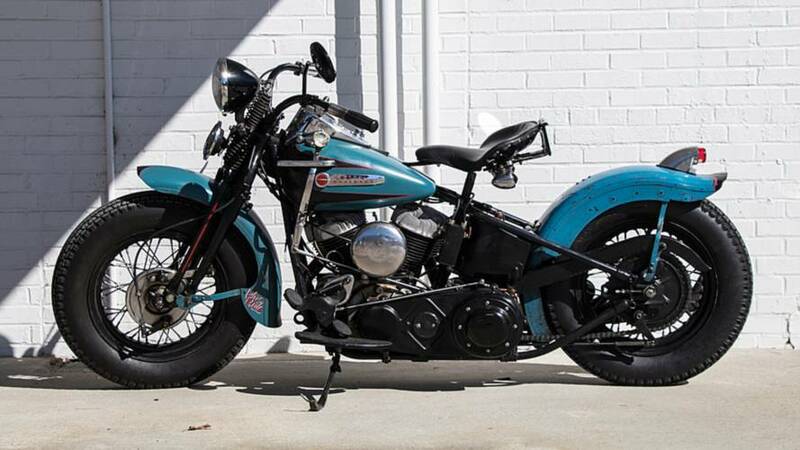 It just fits into what you imagine a bobber should look like, classic lines with a period style paint job and nothing extra to junk up its appearance. The real bonus was that it also ran and handled just as good as it looks sitting in the parking lot, which is certainly not the case with every customized classic motorcycle you see out on the road.